One of my favorite Think Tank Photo bags just got better and a bit bigger and better for air travel. Our friends at Think Tank Photo have just released an expanded version of one of their most popular rolling camera bags. By complying with carry-on size requirements, with the new Airport Advantage Plus roller you can keep your most valuable gear safe and near you when you fly. Plus, the roller’s ultra-lightweight design at 6.9 lbs. (3.1 kg) helps meet weight restrictions, yet features the same level of protection for which Think Tank is known. Its dedicated laptop pocket fits up to a 17” laptop in a padded sleeve, a 10” tablet, or an Eagle Creek Medium Clothing Folder for overnight trips. By using my special link, you will receive free gear and free shipping not only when you order this new roller, but any Think Tank gear. 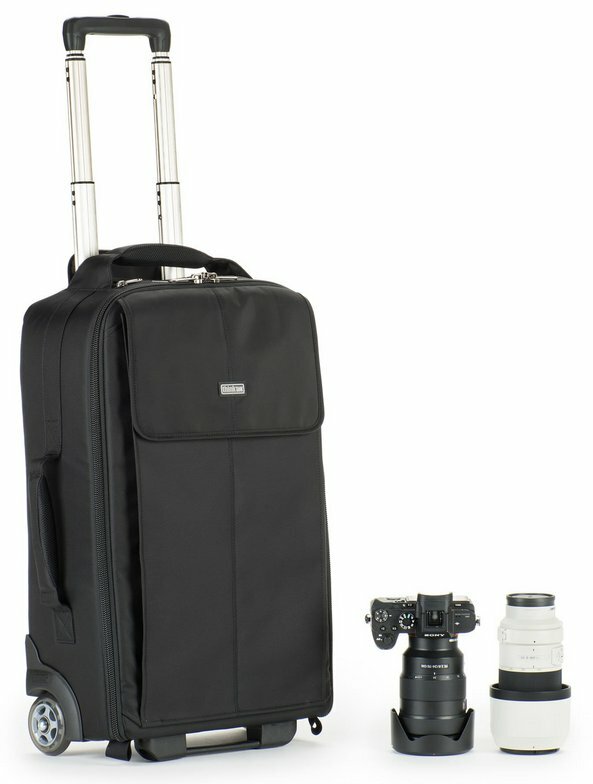 Think Tank Photo’s new Airport Advantage Plus rolling camera bag is specifically designed for traveling photographers. By complying with international carry-on requirements, photographers can keep their most valuable gear safe and near them when they fly. The roller’s ultra-lightweight design at 6.9 lbs. (3.1 kg) helps meet weight restrictions, yet features the same level of protection for which Think Tank is known. Its dedicated laptop pocket fits up to a 17” laptop in a padded sleeve, a 10” tablet, or an Eagle Creek Medium Clothing Folder for overnight trips. The Airport Advantage Pus holds one gripped DSLR with lens attached, one ungripped DSLR with lens attached, plus five to eight additional lenses, and a 17” laptop. Or, it can hold two gripped DSLRs with lenses detached, plus five to seven lenses. For Mirrorless users, the roller can fit two bodies with a crazy amount of lenses. It can hold up to a 200–400 f/4 detached (hood reversed) lens. Exterior: For superior water-resistance, all exterior fabric has a durable water-repellent (DWR) coating, plus the underside of fabric has a polyurethane coating. The bag is also constructed with 420D velocity nylon, YKK® RC Fuse (abrasion-resistant) zippers, custom designed extra tall skid plates, high performance 80mm super quiet wheels with sealed bearings, rubberized laminate reinforcement, and 3-ply bonded nylon thread. Interior: 210D silver-toned nylon, polyurethane backed high-density nylex liner and dividers, 2x polyurethane coated nylon 210T seam-sealed rain cover, closed-cell foam and reinforced PE board dividers, mesh pockets, and 3-ply bonded nylon thread. Headquartered in Santa Rosa, California, Think Tank Photo is a group of designers and professional photographers focused on studying how photographers work and developing inventive new carrying solutions that meet their needs. They are dedicated to using only the highest quality materials and design principles and employing materials that are environmentally benign. Marc Weisberg is an award winning photographer and Sony Artist of Imagery based in Irvine, California. Specializing in Luxury Architecture & Real Estate Photography, Food + Wine Photography, and Weddings & Family Photography, he’s easy to work with and produces clean, crisp, and technically flawless images. Marc’s photography is published internationally in over a dozen books and magazines. You can contact Marc by phone at 949.494.5084…. or email.